CHARAGUA, Bolivia—In 12 years as president of South America’s poorest country, Evo Morales has accomplished many of the goals he set forth when he became the first indigenous person to lead Bolivia. 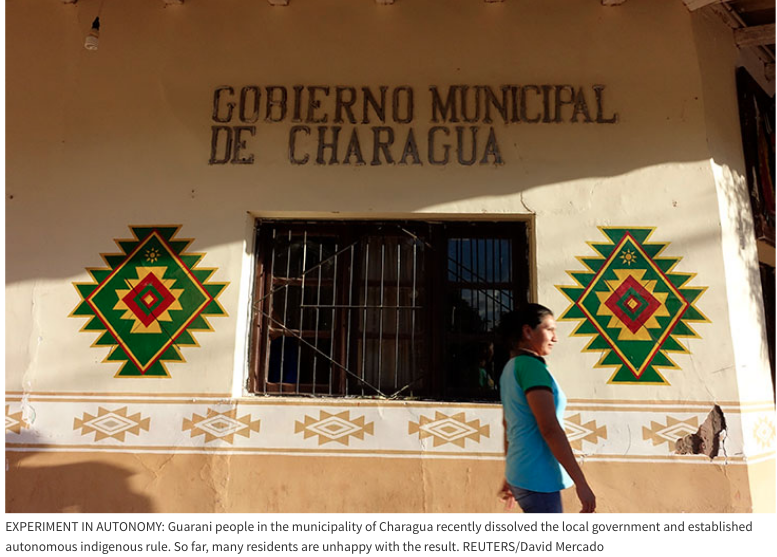 Here in Charagua, in the country’s remote southern lowlands, Guarani people recently dissolved the local municipality and launched Bolivia’s first experiment in autonomous government. The move, made possible by the new constitution, is meant to replace distant, homogenous rule with policies tailored to the local, indigenous reality. Yet here and across Bolivia, indigenous people are increasingly turning against Evo, as the poncho-wearing Morales is known. The dissatisfaction – over everything from proposed development of indigenous lands to his successful gambit to end term limits – is marring what had been widespread acclaim for a leader emblematic to first peoples’ movements worldwide. 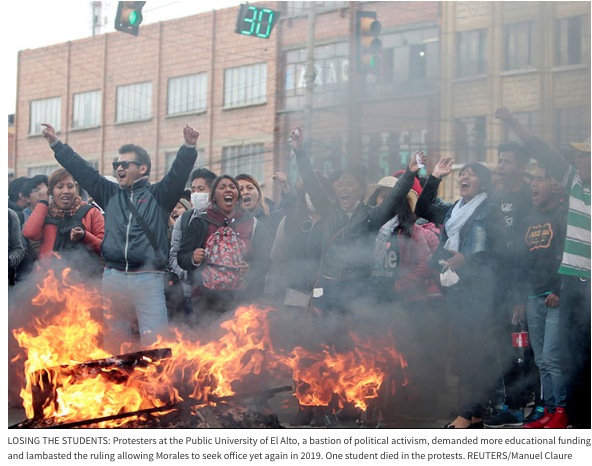 “He should go,” said Joaquín Quispe, a cook whose Aymara family moved from Bolivia’s interior to El Alto, a city where a swelling indigenous influx in recent years made it outgrow nearby La Paz, the country’s administrative center. Morales’ spokeswoman, Gisela López, declined to make the president available for an interview and didn’t respond to requests for comment for this story. A close ally, former Senate President José “Gringo” Gonzales, said Morales hasn’t abandoned indigenous peoples, but has evolved as president to represent and work with everyone. Morales is now the longest consecutively serving head of state in the Americas. He is the sole leader remaining from a wave of leftists, including Venezuela’s Hugo Chávez and Luiz Inácio Lula da Silva of Brazil, who dominated Latin American politics early this century. His name, which graces schools, stadiums, and cultural centers, is increasingly voiced in street protests and scrawled in graffiti. All over the divided country, “Bolivia said no!” sprayings compete with “Evo Yes!” signs painted by supporters of his party, Movement Toward Socialism, or MAS. 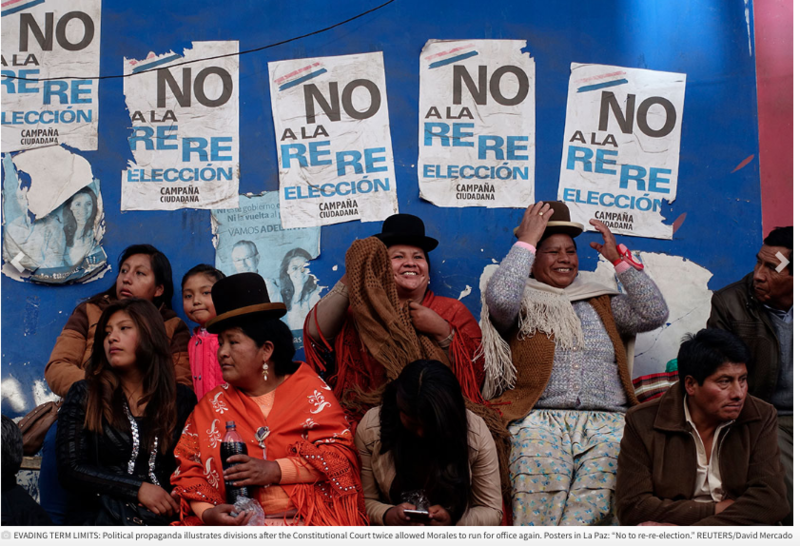 Over the past eight months, Reuters traveled across Bolivia to better understand the waning support for the president among indigenous peoples. From his native Altiplano, the high, arid plateau home to the Aymara, to gas-rich lowlands, where the government has authorized extraction on indigenous lands, many native Bolivians say they no longer feel represented by Morales. 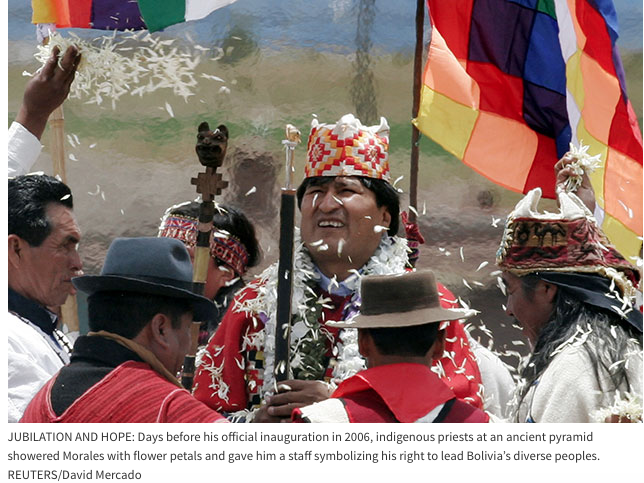 For many, the years following Morales’s 2005 election were marked by jubilation and hope. Before his official inauguration in January 2006, Aymara “maestros,” or ritual leaders, held their own ceremony at the pre-Incan site of Tiwanaku, west of La Paz. Morales, in a traditional red tunic, climbed the Akapana pyramid, where shamans presided over a fire ritual and presented him with a staff symbolizing his right to lead the assembled tribes. For the day-to-day business of governance, Morales appointed women, indigenous peoples and labor leaders to his cabinet. He embraced grass-roots organizations and forged a so-called “Unity Pact,” comprising leaders of Andean, lowland and Amazon tribes. Together, they helped draft the new constitution, approved by 60 percent of Bolivians in a 2009 referendum. Tensions with indigenous groups first emerged in 2011. Enjoying what by then was steadily improving economic growth, Morales proposed a 300-kilometer road through the Isiboro Sécure Indigenous Territory, or Tipnis, a Jamaica-sized refuge in the Amazon. The highway, Morales argued, was necessary to bring basic services to remote tribes. The road, they argued, more likely would facilitate drug trafficking, illegal logging and other unwanted activity. Protesters marched for more than a month, during which police and demonstrators clashed in clouds of tear gas and flurries of rubber bullets. “When Evo took office we thought indigenous people would never have to march again,” said Adolfo Chávez, a native Tacana and former president of The Confederation of Indigenous People of Bolivia, or Cidob, a grouping of 34 lowland tribes. The marching succeeded, at least for a time. That September, Morales halted work on the road for further study. Two major indigenous rights organizations, Cidob and The National Council of Ayllus and Markas of Qullasuyu, left the Unity Pact. 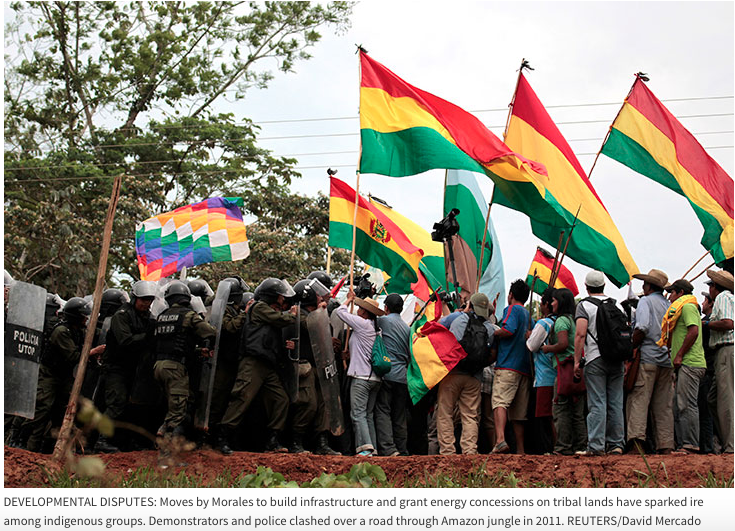 Since then, the split has widened into divisions that fall along political lines, not rivalries among Bolivia’s three dozen ethnicities. Soon, government supporters began to pressure both groups, using MAS loyalists to stage what some members described as coups within the organizations. 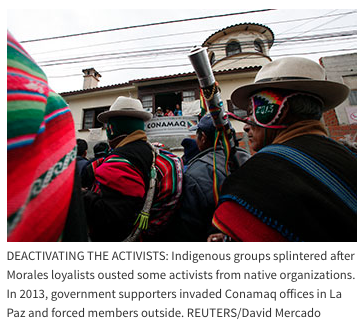 Politics and loyalty to Morales began to matter more than the indigenous cause, they said. Cidob leader Chávez was voted out in 2012. Chávez, who left Bolivia and now lives in Peru, says he was a victim of political persecution for leading the Tipnis demonstrations. Pedro Vare, Cidob’s current leader, in local media has continued to back Morales and criticize the protesters. Reuters was unable to reach Vare for an interview. “We had nowhere to go,” recalls Cristobal Salles, an Aymara and Quechua speaker who was a Conamaq councilman and now farms potatoes. That’s because most of the previous members went on to form dissident indigenous groups. Those groups have campaigned to enforce presidential term limits and against renewed efforts to build the Tipnis road and other projects on native lands. In 2014, Morales began his sustained effort to stay in power. Despite the constitutional limit of two terms, Morales argued that his first administration shouldn’t be counted because he had been elected under a previous constitution. In the Constitutional Court, by then composed mostly of judges nominated by allies of Morales in Congress, he found a sympathetic audience. Except for one justice – Cusi, the fellow Aymara who at that time sat on the court. Cusi sought a strict interpretation of the charter and argued against another term. But the other judges prevailed. Morales ran for re-election and, with 60 percent of the vote, won a third term starting in January 2015. Before long, relations with native groups grew worse still. In February 2015, a government comptroller discovered a $10 million shortfall in a state fund for indigenous projects, finding records of initiatives that had been funded, but never carried out. Two of Morales’ former rural development ministers were convicted of misusing public funds and served brief jail terms. Some onetime Morales supporters were outraged. “It seems corruption has been institutionalized,” Edwin Prada, a lawyer and former advisor to Conamaq, said in an interview. Morales in public comments has said the fund was poorly run. Reuters couldn’t reach either of the two former ministers for comment. That year, natural gas prices fell from a peak in 2014. The country’s economy, while still healthier than that of many neighbors, cooled. Criticism of Morales and his party grew. In  March 2015, residents of El Alto, formerly a bastion of Morales support, handed MAS its first big electoral defeat. They voted out the city’s MAS mayor, who had polarized local voters because of municipal spending, and elected Soledad Chapetón, an Aymara from a center-right party who became the city’s first female mayor. Morales, meanwhile, kept working to prolong his own mandate – first through the failed referendum and then through another plea to the Constitutional Court. By last year, the court was firmly allied with Morales. After opposing other government initiatives, Cusi, the Aymara judge, was impeached by the Senate. The day before the May 2017 ruling, Cusi donned chains in front of government headquarters and scoffed at what he considered his foregone ouster. “They found a pretext to oust me,” Cusi told Reuters. Now the head of a Conamaq breakaway group, Cusi recently announced he would seek the office of attorney general. In a clash with police, one student died. Police said the student, Jonathan Quispe, was killed when students hurled marbles. University officials said he was shot by police. Reuters couldn’t independently determine what led to Quispe’s death. Charagua, roughly the size of Panama, in the 1930s was the site of successful resistance against Paraguayan invaders who sought to seize area gas reserves. Despite having gas, however, Charagua remains poor, accessible only by dirt roads. Guarani leaders there said they, too, are unhappy. Ramiro Lucas, a 44-year-old leader of a southern portion of Charagua, lamented that the region recently had to halt school breakfasts because money was needed for health centers. “Now we have land, but what good is that if we don’t have resources?” he told Reuters. This entry was posted in Bolivia, Drug war - narcotraffick, Economics, Politics, Social Unrest and tagged bad politics, corruption in public office, demagogue, democracy in peril, government failures, Ochlocracy, public policy failures, socialism. Bookmark the permalink.